UB’s new safety app, UB Guardian, uses call and chat communication, along with a GPS-based location system which students can use to send their locations to friends and family. If students, faculty or staff sense danger, they can connect with University Police with just a tap on their phone from now on. On Friday, UPD launched a new safety and emergency app, UB Guardian (Rave Guardian). 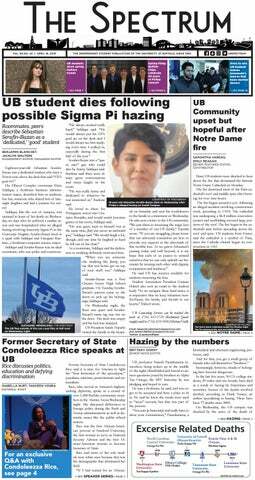 The Guardian app will send the UB community alerts and warnings directly to smartphones, and also allows students to contact police via a chat box. Students, faculty and staff can download the app through the App Store or Google Play. UB community members can sign up for the app’s services through their UB email accounts. The app is an integration of the alert system UB currently has in place with the same company, Rave. Students can use UB Guardian to place a direct call to UPD in the case of an emergency. The app also has a text or chat feature for more non-emergency purposes. If a student is in a car accident, for example, they can send a photo of the accident damage to UPD dispatchers. They can also choose to tag their location with the photo, so UPD can find the scene of the crash easier. Sticht said he hopes the app provides a more efficient and accessible means of communication for students — especially non-native English-speaking students. Besides the chat, another key feature of UB Guardian is a safety timer. The timer allows users to temporarily share their location with a family member or friend, but not the UPD. The safety timer functions in the same way as an Uber app allows passengers to share their ride’s status and location. “I think this is the most important element that students wanted that several universities, like SUNY Geneseo and SUNY Stony Brook, already have in place [with their safety apps],” Sticht said. For example, if a student is walking to their car or dorm late at night on campus, they can send a link for a contact to track them for a set amount of time. They can then notify their contact when they arrive to a location, but if something goes wrong along the way, they can call the contact or UPD. The app is for students, faculty and staff, but UPD customized its features with students in mind. UB Guardian includes resources students may need other than the police, such as the National Suicide Prevention Lifeline, UB Counseling Services and Student Health Services. There are also a number of links for anonymous report forms via the app. These links include UPD’s anonymous sexual assault report form and silent witness report form. The latter is for students who want to submit anonymous tips to UPD. The idea to adopt a mobile app communication platform came from a conversation The Spectrum had with UB President Satish K. Tripathi last year, according to UPD. The app is meant to coincide with UB’s current emergency and blue light systems, according to UPD. If a student calls in to report an incident, UPD dispatchers can use their location to find the nearest blue light station. Each station has a surveillance camera, so dispatchers can attempt to monitor the situation in real time. The Spectrum asked two students to download and try the app. Both said the app could be worthwhile to them. Others such as Wenchao Lou, a senior media studies major, also noted the app’s practicality. “I think I will keep [the app] on my phone, because who knows what will happen,” Lou said.